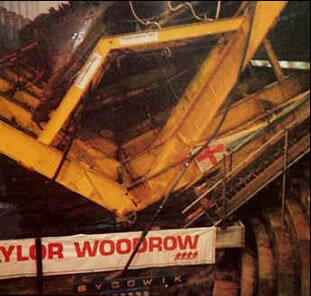 The procedure used by BYGGWIK to rotate the 'Mary Rose' into an upright position. 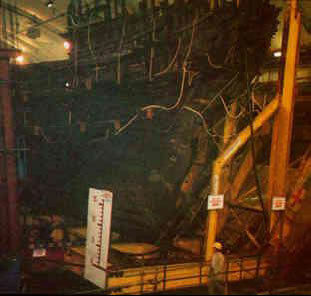 At 11.00 am on July 1985 the pride of Henry VIII's fleet, the Mary Rose, was returned to an even Keel -- the exact time to the hour she sank 440 years before. Gentle handling was imperative for the success of the project. THE MARY ROSE, once the pride of Henry VIII 's fleet, lies on her starboard side in the confines of a Victorian dry dock -- her port side having eroded away during her 437 year sojourn in a muddy nest, 15 metres below the surface of the Solent. She is almost continuously sprayed with water to stop her falling apart as she rests within the steel arms of a cradle at an angle of 60 deg. to the vertical. The cradle, in turn, rests upon the deck of the barge which returned her to her home port of Portsmouth in the winter of 1982. The inadequacy of the barge as a longterm support prompted the Trust at this time not only to remove the barge and replace the dock blocks on which it stood with more permanent piers, but also to return the Mary Rose to an even keel. The latter project proved to be unique -as no comparable exercise had been undertaken, any proposal put forward would inevitably be prone to unforeseen complications.